This is the final revision of Ultima 3 Perfect Solution Technique published on December 30, 1987. This only puts it 7 weeks after the first version, but it has changed substantially with half as many pages and a completely different layout. In terms of artwork, it has less going for it than all the other guides so far but the end of the book does feature a 2 page cartoon of the ending sequence of Ultima 3. I doubt it will look quite like most players imagined it. As with all these U3 guides, it is too small to scan in well without flattening the book but my attempt is on the downloads page for anyone interested. 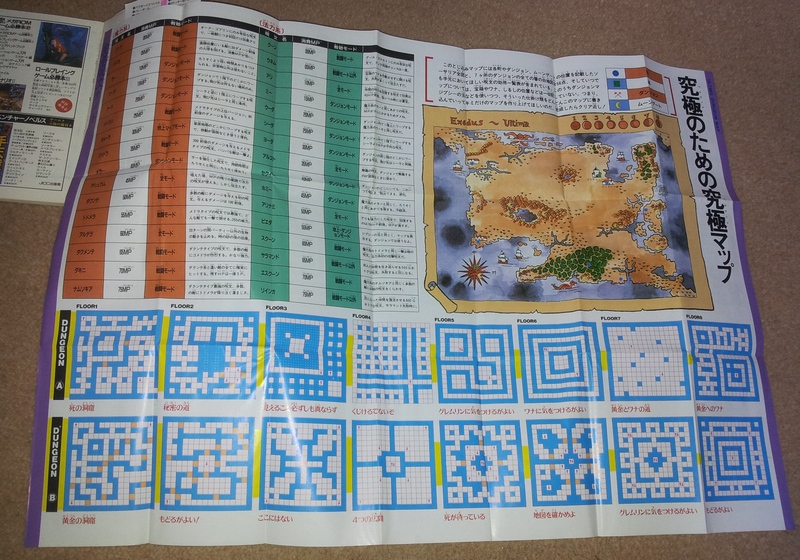 I have electricity again so it’s back to plan A and another scan of a Japanese Ultima 3 guide. This one is the Perfect Guidebook To Overcome, published in November 1987 by Family Computer Staff. It’s the shortest of the lot at 64 pages, but from my point of view of not being able to read Japanese the best of the three as it is jam-packed full of cartoon artwork. I’ve put a scan in the downloads with the others here. For the true completist there are at least 2 variants on this book, as the inside slip cover and back page on my two copies carry different adverts. The presentation is very similar to the Perfect Solution Technique guide from yesterday with plenty of original art. This guide was slightly cheaper, and apparently came with a glossy map (which I don’t have). It’s all equally unintelligible, at least to me, but a scanned copy is now available in the downloads. I’m not done with Japanese Ultima 3 guides yet, so expect another tomorrow. Anyone who has ever browsed through the Ultima Ultimate Collector’s Guide won’t fail to have noticed the amount of Ultima memorabilia that came out of Japan. I don’t have any ambitions to try and track all of this down but I have been picking bits up as and when I see them cheap. 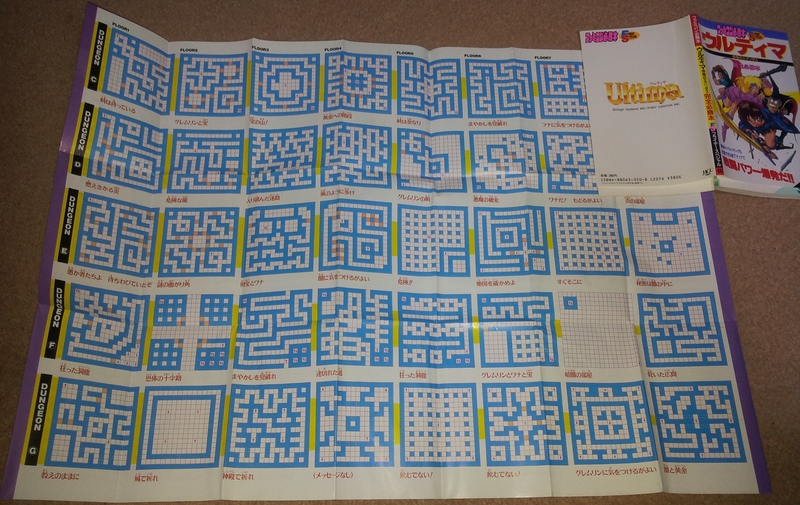 Thanks to the Collectors Guide, I can tell you that this is the Ultima 3 – Perfect Solution Technique hint book, published in 1987 by Tokuma Communications. It’s a small paperback with a glossy cover sheet and covers the Famicom version of the game. Since I can’t understand a word of it, I can’t say much else other than it’s in colour throughout and there are loads of pictures along with all the maps you would expect. These little paperbacks aren’t the easiest to scan in but it’s now available in the downloads for anyone who wants a look. This was published in 1989 by FCI and is a translation from the Japanese original. There were equivalent books for later Ultima games released in Japan but these never got a translation unfortunately. I’m limiting myself to Western releases so you won’t be seeing any of the others on this blog. This book wasn’t the easiest to scan in as the print tends to go right to the spine but it’s not come out too badly and is now in the downloads. 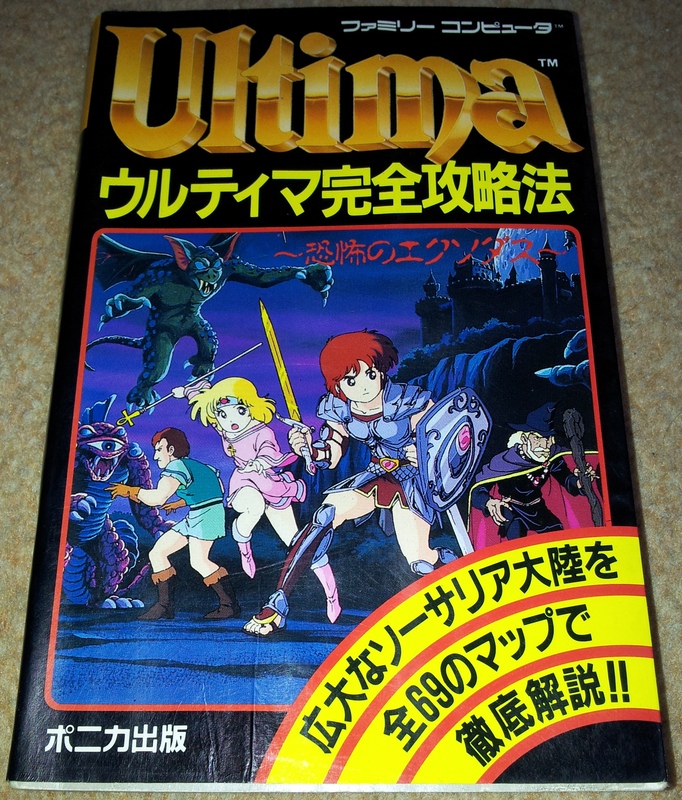 The Ultima series was huge in Japan leading to all sorts of spin-offs and merchandise. These included a series of Manga’s (link) which only have a passing resemblance to the Ultima I know. The U3 guide starts with a Manga of its own telling the story so far. I never quite imagined most of the characters looking like this. There was a severe clothing shortage in early Sosaria it seems, but it’s well drawn and moderately faithful to the series. We then get onto the stuff that is going to help you beat the game. This is all presented in an equally colourful manner, starting with general advice on party creation, weapon stats, items in the game and the like. I’ve never actually played U3 on the NES apart from starting it up for a quick look. It’s clearly branched away from the original game in some ways looking at these but remains fairly true apart from some name changes. There is a full bestiary with pictures of all the denizens of Britannia. They are presented in a very cartoonish manner and look a little ridiculous. Give me Denis Loubet’s drawings over these any time. This guide presents a very cartoonish version of Ultima and I prefer the regular U3 cluebook without a doubt. There is more information in this and it’s certainly colourful but it’s a long way from anything Origin would have turned out themselves. The tagline of “Not just kid stuff” on the cover strikes me as a little ironic but it still has to be worth a look just for the comic at the start.